What is the Double Declining Balance Method? Home » Accounting Dictionary » What is the Double Declining Balance Method? Definition: The double declining balance method, or DDB, is an accelerated system to record depreciation over an assets’ useful life by multiplying an asset’s beginning book value by a depreciation rate. It’s called a declining method because the amount of depreciation expense recorded each year decreases until the asset is fully depreciated. What Does Double Declining Balance Method Mean? What is the definition of double declining balance method? Declining balance method is considered an accelerated depreciation method because it depreciates assets at higher rates in the beginning years and lower rates in the later years. In this sense, the declining balance method frontloads the depreciation expense on the first half of the asset’s life opposed to the straight line method that evenly distributes depreciation expense over the asset’s life. It might be easier to understand with an example. It might be easier to look at an example. Assume a company purchases a piece of equipment for $20,000 and this piece of equipment has a useful life of 10 years and a salvage value of $1,000. The depreciation rate would be calculated by multiplying the straight-line rate by two. In this case the straight-line rate would be 100 percent divided by the asset useful life or 10 percent. Now the double declining balance depreciation rate is calculated by doubling the straight-line rate. The double declining depreciation rate would equal 20 percent. Now that the rate is calculated, we can actually start depreciating the equipment. The declining method multiplies the book value of the asset by the double declining depreciation rate. The depreciation expense is then recorded in the accumulated depreciation account, which reduces the asset book value. This happens every year of the asset’s useful life. Here is a spreadsheet example. 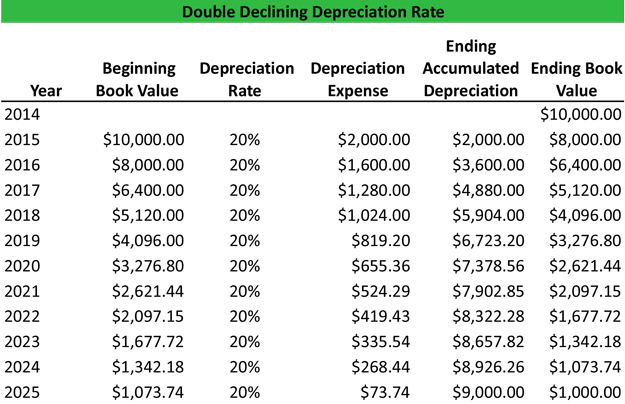 Download this accounting example in excel to help calculate your own Double Declining Depreciation problems. As you can see, the depreciation rate is multiplied by the asset book value every year to compute the deprecation expense. The expense is then added to the accumulated depreciation account. Notice that the last depreciation expense is not set by this formula. The last number is a plug number because the asset cannot be depreciated lower than its $1,000 salvage value. Double declining depreciation is helpful for businesses that want to recognize expenses upfront to save taxes. It also matches revenues to expenses in that assets usually perform more poorly over time, so more expenses are recognized when the performance and income is higher. Define Double Declining Balance Method: DDB method is an accelerated depreciation method that allocates more of the asset’s costs in the beginning years of its useful life instead of evenly throughout its life. 1 What Does Double Declining Balance Method Mean?